Last December, a gunman opened fire at Aztec High School, killing two students and then himself. The shooting received little attention in the national media. History teacher Fritz Polk, right, learned after the shooting that the gunman had targeted him and his class. He says arming some teachers needs to be part of the local and national discussion on school security. 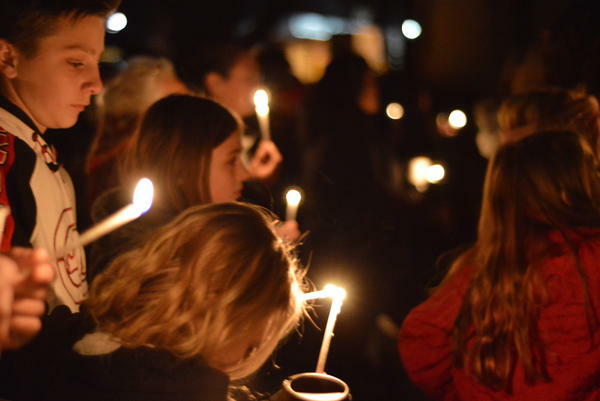 Aztec High School students and residents gathered for a candlelight vigil in December after the shooting at their high school. Walk the bustling halls of Aztec High School in northwest New Mexico and at first glance you might think nothing is wrong. Banners promote the Aztec Tigers girls' softball schedule. Students roughhouse out on the basketball courts. But talk to kids for just a few minutes and it's clear all of that is on the surface. They're hurting. "I feel like my security has been taken away from me," says Sarah Gifford. 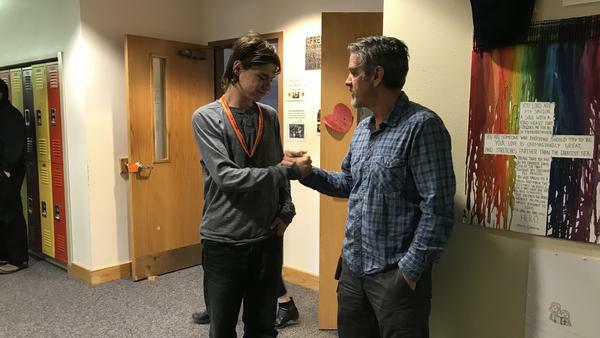 Three months ago, the 17-year-old junior was in the hallway just a few minutes before a 21-year-old gunman, who'd posed as a student, walked up and down firing randomly. He killed two students before turning the gun on himself as police closed in. "I don't even go to the mall or Walmart the same way because I'm scared someone's just gonna come in," Gifford says. Gifford's voice shakes and she fights back tears when she talks about the morning of December 7. Two of her classmates, Casey Marquez and Francisco Fernandez, are dead. "There's only two, it's not like Florida, you know. They lost a bunch of kids and I feel terrible they lost so many kids," Gifford says, "But this is [also] a big deal for us." It remains a big deal for this high school of 900 in the New Mexico high desert just south of the Colorado border. Aztec, population 5,600, lies along the banks of the fickle Animas River and it's surrounded by some of the most productive oil and gas fields in the country. Locals say the school shooting is one of the worst tragedies anyone can remember. Three months on, even the smallest things – a slam of a locker door – still put students on edge. And some feel hurt that the shooting prompted so little national coverage. They feel like their tragedy was overlooked. "We're settling back down and then the Parkland shooting happens, [it] stirs it all up again," says Fritz Polk, a high school history teacher. A lot of Polk's students are in what he calls "the second wave" of PTSD. The initial shock and numbness has worn off, and now reality is setting in. After Parkland, he says: "They're watching the news, they're listening to videos, they're kind of reliving it." Polk too relives the tragedy every day when he walks into his classroom. A few days after the shooting, he learned the gunman had targeted him personally – and his class – in a manifesto. And the shooter died just outside his classroom door, steps away from where Polk had barricaded his students. Polk works as a chaplain for the sheriff's department and has responded to a lot of traumatic incidents, though nothing as close to home as this. He had to identify Marquez and Fernandez for investigators and notify their families. Aztec is in a fairly remote area of the Four Corners and state resources for mental health and counseling quickly poured in after the shooting. Today there are also drop-in counseling sessions available to students. Polk makes a point to tell his students that he too is utilizing the services. But you can't force people to go. "I don't think everybody knows that they need the help until they're kind of in a free fall," he says. Some students have dropped out. Others have parents who are opting to homeschool. Teachers say grades are slipping and even some of the straight-A students are acting out. There have been bomb threats, jokes about the tragedy. Last month, police arrested a student for threatening to shoot up the school. 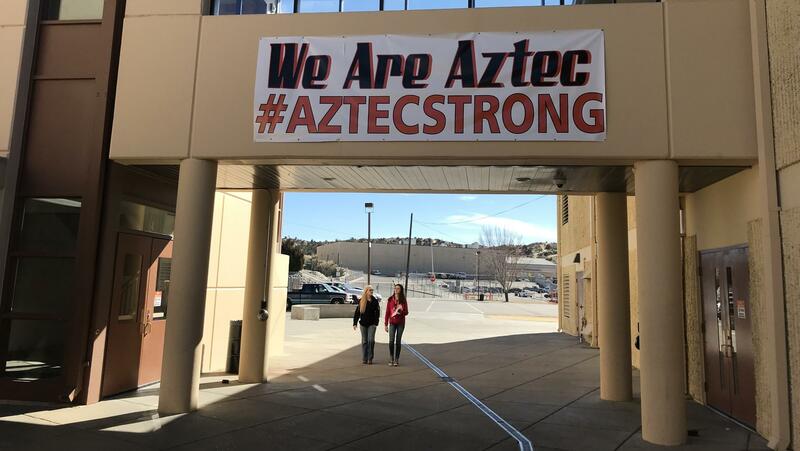 "I think at one point we thought things were starting to smooth out," says Kirk Carpenter, Aztec's superintendent. "And then the very next day we had some fallout." Like many staff and students, Carpenter wears two rubber wrist bands – "Aztec Strong" and "Psalm 46:1." He's spent his entire 28-year career in the district, growing up in nearby Farmington and working here first as a teacher and then later in administration. For him, the shooting exposed serious gaps in security across the high school's mostly open, airy 11-acre campus. There's a public street that runs through it, and a lot of open land nearby. Carpenter says rural schools need more funding for security and other upgrades. Unlike a lot of more urban schools, most of this district's buildings haven't been upgraded – or rebuilt – since the 1999 Columbine massacre. "Sometimes we talk too much and it's time for action," Carpenter says. The district employs one school resource officer for six schools, but she wasn't at the high school at the time of the shooting. They've since gotten a full time police officer stationed at the high school and added three security guards. They're not armed. Students have to wear ID badges everywhere. Many parents say their kids still don't feel safe. Glenna Moore, who has two daughters at Aztec, says her youngest didn't want to go back after the shooting. "It's hard for her to trust people — what's in that backpack that the kids [are] getting off the bus with," Moore says. This breaks Moore's heart. She graduated from the same school in 1991 and worked there for seven years as its nurse. "What are we teaching them right now," she asks. "Mostly we're teaching them about violence and what could happen, they're not even able to learn." One of the more controversial school security proposals to be floated locally since the shooting has been whether to arm teachers. For history teacher Fritz Polk, the shooting that targeted his classroom was affirmation that this has to be on the table for discussion. "Gunshots are booming and you've got 20 kids that are scared spit-less and all you have is a book, a yard stick," he says. Like a lot of people, Polk's personal views on guns don't fit into some neat political box. He says he supports banning some assault-style rifles and bump stocks. He also thinks willing teachers, like him, should get screened and trained and be able to carry a gun in class, as a last line of defense. "In a utopian world, yeah, we don't need to be armed," Polk says. "I would rather be a teacher and never have to pick up anything other than a book, but at that moment I could not just be a teacher, I had to be a defender." A push to arm teachers might be expected in a rural, conservative-leaning town like Aztec. A lot of people here own a lot of guns and the December shooting led to some tough conversations about guns in schools. Isaiah Mendieta, a junior at Aztec High, says guns are a big part of the culture here. "We go shooting, hunting with them," Mendieta says. "We have tons of guns, we are a very pro-gun family." But at Aztec High, you also get the sense that this movement isn't some reaction to national politics. It's more born out of a feeling of exasperation. Folks are willing to try anything in order to prevent another shooting. "I'm not saying have every single one of them [has to] go through a course, but if they want to, like Mr. Polk, just arm them, [then] they have it," Mendieta says. Mendieta was holed up in Polk's classroom during that terror-filled morning. He hid with his classmate and childhood friend, Sarah Gifford. Both are shaken. But each is drawing a different conclusion from the tragedy. "We didn't have protection before our shooting," Gifford says. "Schools with a lot of funding have that but small schools like our school don't and I feel like that should be mandatory." But Gifford is nervous about the idea of arming teachers. "You put a gun on school, who's going to have access to it," she says. "It's just more complex than people want to make it. Unlike some of its western neighbors, New Mexico doesn't currently allow for concealed carry on campus. In some more isolated rural areas, the argument goes that law enforcement response times are long, so some school staff should be trained and armed in case the worst happens. Superintendent Carpenter points out that police responded to Aztec High School within just a few minutes. He says arming teachers is a non-starter. For one, it's illegal here. Second, insurers have notified him that they wouldn't cover the school if teachers were armed. "It's a misguided approach," Carpenter says. "I think we need to concentrate on prevention." In Aztec, marches to advocate for arming teachers have been planned. This Wednesday, during the planned national student walk out, some students here will hold a "walk in." They plan a moment of silence and discussions about school security. The community appears to be mixed over how best to move forward. Students like Sarah Gifford and Isaiah Mendieta agree this is a time for unity. And both bemoan the fact that they feel like their voices aren't being heard because they're technically minors. Gifford will be able to vote in just a few months. "We need to put our thoughts aside and stop making it so political and start thinking about the kids," Gifford says. Both these kids have different views. But they want to talk about them, be civil, they say. Why can't the country do that? "People need to learn to respect other people's opinions," Gifford says. "I respect that he thinks that's right and he respects me for thinking that it's okay." Mendieta says everyone wants to feel as if they're right. And he says that's causing chaos. "They just want to pick sides," he says, "There's really no meeting in the middle." Their biggest worry? That nothing will change and the school shootings – like their own tragedy on December 7 - will just keep happening.